There is a new team in the UAM family. Dr. James Gilbert, of the Mechanical Engineering department at Purdue University, facilitated the purchase of a SonicLayer R200 UAM machine. The small scale UAM system was installed in March and is already contributing to student projects. Dr. Gilbert’s work in ultrasonic additive manufacturing ranges from understanding the underlying physical principles that govern bonding in UAM to developing novel uses for the process. Specifically, he is attempting to develop multi-scale models suitable for closed control of the process that include the macroscopic dynamics of the sonotrode and workpiece to predictions of dynamic recrystallization at the bonding interface. Mark Norfolk and Cam Benedict made the trip over to install the unit and demonstrate its capabilities. 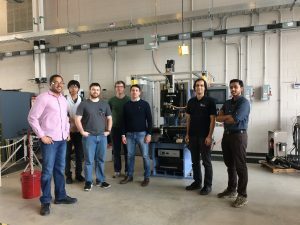 Fabrisonic is looking forward to future work and collaboration with Purdue University and Dr. James Gilbert (far left in the picture below)! Last week Fabrisonic was selected as a finalist for the CTMA Technology Award. 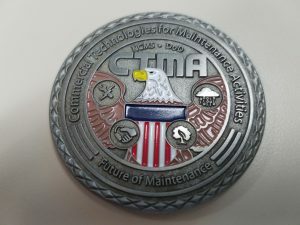 The CTMA program, created in 1998, is a joint Department of Defense/NCMS effort promoting collaborative technology validation, demonstration, and transition within DoD. Its objective is to ensure American troops and their equipment have the most up-to-date and best-maintained platforms, technologies and tools available. Each year they search for new manufacturing technologies that can help accelerate maintenance and repair. Of fifty-seven nominated companies, Fabrisonic was down selected as one of six finalist and given an opportunity to present at the CTMA annual meeting. Fabrisonic was selected as a finalist due to our metal 3D printing technology’s ability to repair heat treatable aluminum components without affecting material properties. 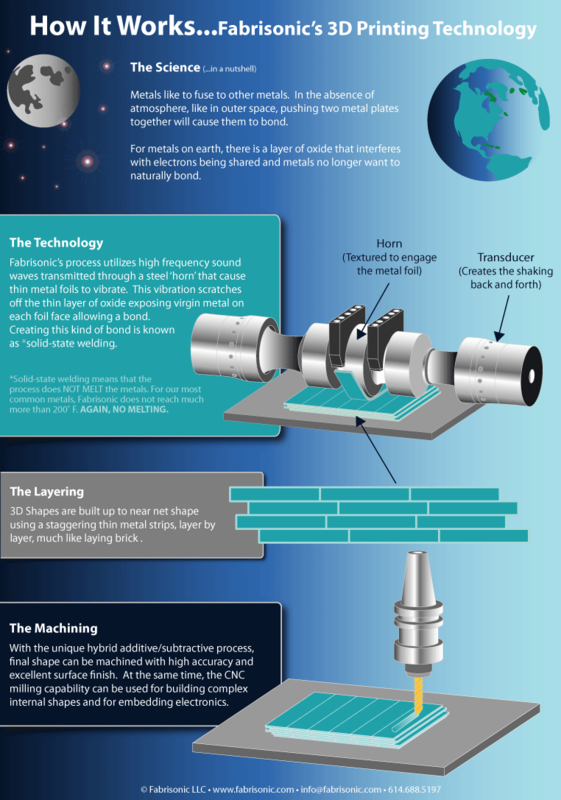 The aerospace industry requires repair of high value tight tolerance components. Traditional techniques use costly heat treatments that limit size and material type. Consequently, expensive customized components are frequently discarded, which, in turn increase procurement and operating costs. Ultrasonic Additive Manufacturing (UAM) provides a repair solution that is both feasible in practice and cost. UAM is a solid-sate (no melting) 3D metal printing process. Because no melting occurs in the process, no special atmosphere is needed, solidification and high temperature chemistry is avoided (enables joining of different metals and alloys), and heat treatments of components are unaffected. Also, large parts can be fabricated (6’ x 6’ x 3’) due to the lack of atmosphere requirements.